Ben is super-excited to talk into a big yellow windscreen. Photo by Benjamin Higgins (@flopcardboard) / https://www.instagram.com/p/BJf1ueHgqiO/. Used with permission. Vermont Public Radio’s live noontime show, Vermont Edition, discussed the board game renaissance of the 21st century with some locals in the Vermont tabletop community: Benjamin Higgins, manager of the venerable Quarterstaff Games in Burlington, and Andrew Liptak, co-founder of Geek Mountain State. Also popping in to comment were Matt Golec and Robert Dijkman-Dulkes, designers of Penny Press and the prototypical Westmonster Kennel Club games. My favorite part of the conversation is how everyone in the mix reaffirmed that board games — and all tabletop games — are about building relationships and community. People get together to play board games. Tabletop games need someone else to be in the room. Game stores become hubs of community- and relation-building. Robert puts in a nice pitch for Green Mountain Gamers providing venues all around the state for people to meet their neighbors and find new people with whom to enjoy excellent games. Carnage also gets a tip of the hat as Vermont’s premiere board and tabletop game event. When tabletop games make it to something as mainstream a media outlet as public radio, I feel like we’ve reached a new peak in terms of making the hobby more visible. Web shows like Tabletop are great, but over the air terrestrial media is a new tier of reach altogether. 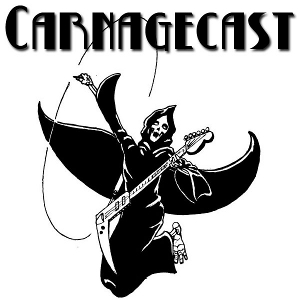 With Winter Weirdness this past weekend in Barre, I took the opportunity to record an entirely solo episode of Carnagecast, talking about what I got to play and do that day. I went out of my comfort zone on this episode. I always prefer to have another person with whom to converse on the podcast, but in this case, time was short and I was reminded there are people out there who have made the monologue their format of choice, like Mike Schmidt of The 40 Year Old Boy and Mike Luoma of Glow in the Dark Radio. Now, both Mikes are professional talkers and significantly practiced at their craft, so I’m thinking of this as a tiny glimpse into the format, a way to get a sense of what it’s like. And after my first attempt — not counting short intros and outros I’ve done for prior Carnagecast episodes — I will say that recording solo is nerve-wracking. Every slip of the tongue is amplified when talking to oneself. Next time — and I guess there will be a next time, because now I can no longer lament not being able to line up a guest in time to post for Monday morning — I think I’ll go for more of the audio essay style, probably because I plowed through a head of Rumblestrip Vermont episodes over the weekend. I am nothing if not a palimpsest of influences. Winter Weirdness is coming up this Saturday in Barre. My dance card already has Eldritch Horror with the new Mountains of Madness expansion, so that will be a fun way to kick off the day. Hopefully after that, I can get in some face-to-face Sentinels of the Multiverse and perhaps even Call of Cthulhu. Green Mountain Gamers announced new donations from Black Moon Games this week, so there’s still more good stuff to win in the raffle benefiting the Vermont Center for Independent Living. Come play some games, meet neat people and benefit a good cause! Erica Heilman, host of Rumble Strip Vermont, posted an episode last night, titled Magic: The Gathering, in which she explores the game of Magic: the Gathering through the eyes of players at the Book Garden in Montpelier during the weekly Friday Night Magic hours. Erica’s son plays Magic, and this episode is like getting to peek through the eyes of someone peeking into the hobby. I love the thoughtful, reflective answers Erica gets to her questions, from interviewees of all ages. As a bonus, you can also listen to Erica’s son try to teach her how to play Magic in this raw audio clip. I think I can hear them both smiling throughout, which is good, because they get into a bit of a loop about what lands are good for, and why anyone would ever tap them. 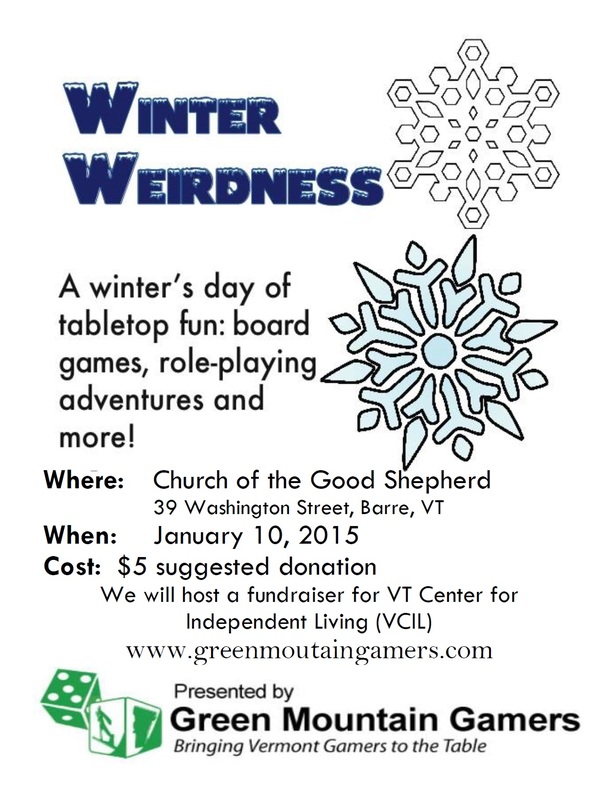 Green Mountain Gamers announced the time and place for their Winter Weirdness game day: January 10th, 2015, from 10am to 10pm at the Church of the Good Shepherd in Barre, Vermont. Mark your calendars! The Church of the Good Shepherd’s been a pretty amazing space for these game days. The undercroft is a cozy space that’s like a cross between a church hall and a rec room. The church has always been a great host, and Green Mountain Gamers tries to return the favor, first with a food drive to benefit the church’s food shelf and now a raffle to benefit the Vermont Center for Independent Living. These game days are great casual, drop-in events. Bring a game, try someone else’s — I foresee lots of new holiday loot fresh from the shrinkwrap — and make some new friends. It’ll be fun! A new episode of Carnagecast posted last night. Carnage staffer Ray joined me to talk about the upcoming A Fistful of Carnage game convention in Killington, Vermont next month, November 7th through the 9th. We talked a bit about what’s on the schedule — keeping it spoiler-free, of course — and some things to keep in mind when planning a trip to Killington. It gets cool up there on the mountain in November! The convention book should be mailing out and appearing online imminently, so I took this episode as an opportunity to get back into the swing of recording, as well as recognize the culmination of a great deal of background work is about to pay off for all the attendees who have been looking forward to another great weekend of playing games at Carnage. And seriously, I will be hanging out at the Snowshed information desk most of the weekend. Come say hi! Green Mountain Gamers return to the Burlington area for Fall-loha 2014, their annual autumnal game day, on September 27th. This year, they’re classing up the party by hosting it at the Windjammer Inn & Conference Center in South Burlington, convenient to the greater Burlington area, the interstate and some pretty good food nearby. It’s a free event, though a suggested donation of $5 is gratefully accepted to offset the costs of hosting the day. It’s always interesting to see the turnout at a Green Mountain Gamers event, because it’s usually half people I know, and half newcomers. And in Burlington, my own stomping grounds, those newcomers may turn out to be from around the corner. Last year, that’s how I discovered the existence of Brap’s Magic, a new local game store. This year, who knows who I’ll meet? I’ve been on a Sentinels of the Multiverse kick lately, so I’m hoping to play that, especially since my friends scored me two alternate hero cards at GenCon: Dark Watch Mr. Fixer and Super-Scientific Tachyon, which I will receive at the game day. I’ll have my Call of Cthulhu decks, too, of course. Doomtown, too, if there’s interest. Green Mountain Gamers always put on a good time, so I’m really looking forward to this game day — and the shorter commute. When did I turn into such a card-flopper? A little free library. Image by John Phelps. Last week, Geek Mountain State reminded me of little free libraries: post-top libraries scattered around, serving the local community. Burlington has at least two: Calahan Park on Locust Street, the community garden on Pine Street and a second on North Avenue, near Convent Square. Aside from filtering Paperbackswap books into circulation that haven’t moved since I reposted them, I’m wondering about thinning my own role-playing game library through little free libraries — maybe some lesser-loved board games, too. Things like my Labyrinth Lord print-out, or the sadly large panoply of HERO books about which I really ought to have known better. What do you think? What would you do with a bunch of books that aren’t worth the trouble to sell piecemeal? Carnage Noir happened over the weekend. It was, in short, good. I ran my Ghostbusters adventure — more on that in a later post — played Igor in a Discworld game with a lisp deemed incomprehensible, hooted and hollered during the Cube of Death geek trivia game show in the theater, caught up with many friends I hadn’t seen in a while and generally had a very, very good time. 2012 was a little bittersweet for me. Carnage is leaving the Lake Morey Resort in Fairlee to take up residence in Killington come November 2013. So all weekend, I had little “this is the last time” moments: the last breakfast at Gilman’s Diner, the last sprint through the hotel’s warren-like halls with its inexplicable nooks, zigs and zags, the last pick-up game in the lounge and many more. Conventions move from hotel to hotel all the time and I recognize there will be some new lounge in which to hang and play games, but Lake Morey will always be special to me. The prospect of going to Carnage came completely out of the blue in 2005. Days beforehand, a friend asked, “Hey, do you want to go to this?” I had no idea what it was, but signed on. I’ve gone every year since, as a player, as a GM, as a staff member. Clearly I am stuck in deep with the Carnage culture and community. And that’s where Carnage shines. It has an air of conviviality, the feeling of a far-flung clan of kindred souls — now flung as far as Arizona and British Columbia, thanks to Monk and Munk — gathering for three days out of which everyone’s going to wring what they love best. It’s not just about playing games. That’s the vehicle. What that vehicle transports is community, shared joy and a good time. In my eight years at Carnage, I’ve watched lasting friendships form and children grow up. The kids playing in the pool a few years ago are now playing games and running them. The newest generation of Carnage GMs stepped up this year with Dungeons & Dragons and Clay-O-Rama. A couple of adults hovered nearby, but you know, they weren’t needed. Those young GMs knew exactly what they were doing. And that’s pretty awesome. Here’s to Carnage on the Mountain at Killington next year. We’re going to help make it exceptional all over again.